Originally published 1900. 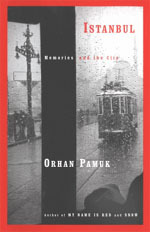 This edition: 2001. Farrar, Straus and Giroux. 206 pages. Recommendation from: I think it was Eva of a Striped Armchair. 15-year-old Claudine is in her last year at the village school. Her father could have afforded to send her to a boarding school, but Claudine prefers the countryside of her youth. She also quite likes being the queen bee at her school. Claudine at School is a tale of Claudine’s mischief at school among her classmates and the teachers. Claudine is a vain, willful brat that I would hope never to meet in person, but she is absolutely delightful as a character and narrator. She is full of life and observes her fellows and elders with sharpness and humor. She likes to come off as worldly-wise to men, but in Claudine at School, her affections are directed mostly at the sly and pretty Aimee, the assistant teacher. Aimee’s head gets turned by the headmistress, however, and Claudine must settle for being amused at the pair’s indiscretion and sometimes neglectful management of the school. Claudine is admired by the younger set – particularly Aimee’s little sister, Luce – and has varying levels of companionship with her own class. She likes to insult the “lanky” Anais, but Anais is probably the classmate almost Claudine’s equal in cleverness and perception. I think I really love stories set in small schools in the past. Last year, I loved all the scenes set at the Montana one-room schoolhouse in Ivan Doig’s The Whistling Season. I like seeing the push and pull between the schoolchildren who are stuck together year after year. My favorite parts in Claudine at School were when the classmates were thrown even closer together due to shared experiences, such as the Certificate exams in Claudine at School or preparing for a French official’s visit to town. I think I liked these parts because I liked seeing Claudine get caught up with the communal effort. She’s usually looking to be the individual at all times, but then there are these times where she clearly enjoys the place she has made for herself in her small community. Only a fortnight till the Certificate! June oppresses us. We bake, half asleep, in the classrooms; we’re silent from listlessness: I’m too languid to keep my diary. And in this furnace heat, we still have to criticize the conduct of Louis XV, explain the role of the gastric juices in the process of digestion, sketch acanthus leaves and divide the auditory apparatus into the inner ear, the middle ear and the outer ear. There’s no justice on the earth! Louis XV did what he wanted to do, it’s nothing to do with me! I had thought I might read the complete Claudine (which in this anthology also includes Claudine in Paris, Claudine Married, and Claudine and Annie). However, after some pages into Claudine in Paris, I realized that I preferred her in the school setting. Recently, a few book bloggers have started the Bloggers’ Alliance of Nonfiction Devotees (BAND) – “Advocates for Nonfiction as a Non- Chore.” BAND members will be hosting monthly discussions related to nonfiction. Well, I’m on board with that! Nonfiction has been a part of my regular reading diet for a while; Sebastian Junger’s The Perfect Storm was one of the first books that demonstrated to me how engrossing nonfiction reads can be. And to echo what Kim of Sophisticated Dorkiness says, nonfiction is not a monolithic category – there are so many types of nonfiction out there, and so many subjects. The BAND discussion question for July addresses this aspect of nonfiction by asking: What is one of your favorite types of nonfiction to read? OR What is one of your favorite nonfiction topics to read about? But to be even more specific, my favorite travelogues seem to be those where things don’t go according to plan. I’m tempted to call this type of travelogue, the travel thriller, although sometimes the mishaps are more funny than scary. I know that some of my best personal stories about traveling involve the unexpected, even the unwelcome, like this one time when the Glasgow hostel’s last-minute “holiday suite” accommodations turned out to be some guy’s flat. I know that when things went wrong on my own trips to unfamiliar places, I learned so much about my own and my friends’ resourcefulness. Most travel narratives involve the comparison of the traveler’s culture with the cultures encountered in the traveler’s journey. The misadventure travel narrative often is the result of amplified cultural differences or misunderstandings. In the scarier travelogues, the travel writer is suspected of being an enemy or threat by a specific group and treated with aggression, even hostility. The traveler gets out of his or her depth, fast. Or the journey is in wilderness and things don’t go according to plan because nature laughs at the traveler’s plans. 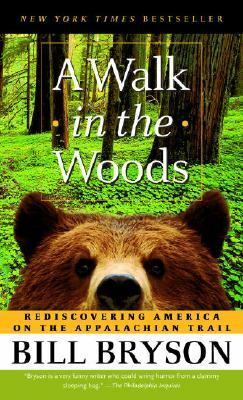 A Walk in the Woods by Bill Bryson is definitely a humorous misadventure, at least as Bryson tells it. Bryson and his even more ill-prepared friend Katz take on the Appalachian trail. 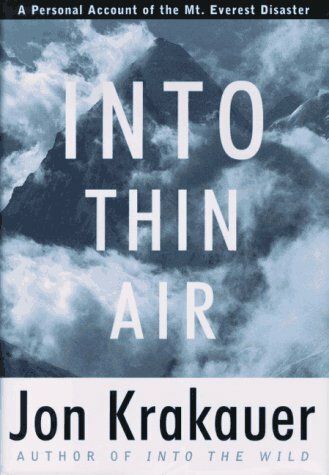 It’s been a few years since I read this, but I clearly remember a scene where, in Maine, Katz goes flailing off-trail down a hill toward a distantly seen lake. Undress Me in the Temple of Heaven by Susan Jane Gilman is a nailbiting account of Susie’s post-college graduation trip to China in the late 1980’s, when the country was only newly open to backpackers. Susie travels with a college friend, Claire and both become sick at different times in the trip. Even worse, Claire starts behaving strangely, leading to a nightmarish situation for both of them. 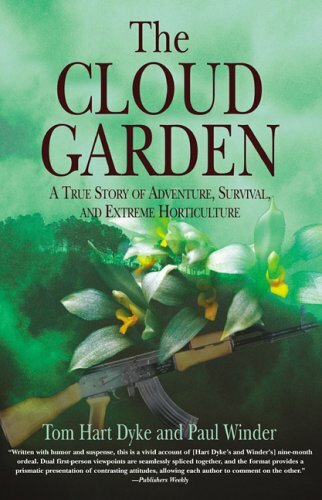 The Cloud Garden by Tom Hart Dyke and Paul Winder is a joint account of the authors’ experiences in the Darien Gap (which is at the Colombian / Panamanian border). In 2000, the two British men decided to travel across the Darien Gap on foot despite repeated warnings about its danger. The two were kidnapped by FARC guerrillas and were held for nine months in various locations within the rainforested area. Library Loot is a weekly meme hosted by Claire of The Captive Reader and Marg of The Adventures of an Intrepid Reader. Readers share what library books they have picked up recently. Marg is hosting this week. This library loot post is actually the accumulation of several library trips, adding up to quite a lot. 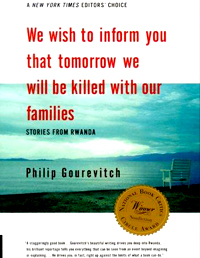 – I’ve heard high praise for Gourevitch’s book about the 1994 Rwandan genocide. It has a heck of a title. – This was one of the ‘it’ books for a little while, five stories about children, set in various countries within Africa. Its cover has always drawn my eye. I’ve read the first two stories so far. This story covers about fifty years in the life of Molly Petree, a young woman from North Carolina whose parents are killed in the Civil War. 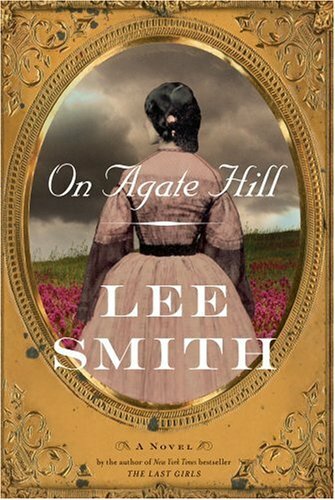 This will be the third book I have read by Lee Smith – I love Smith’s storytelling style, and her knack for telling stories that take place over many years. – This was one of my favorite summer reads a few years ago and I decided to treat myself to it again. – One of those books that is a well-known entity, but I haven’t got around to reading it myself. Soon I will. This is a collection of four urban fantasy stories. I’m checking it out mainly for Briggs’ story “Alpha and Omega” which is the story that started off her Alpha and Omega werewolf series, a sort of spinoff series for Briggs’ Mercy Thompson series. – This non-fiction book chronicles the anti-slavery movement as it occurred in Great Britain. I will probably rewatch the film Amazing Grace after reading this. 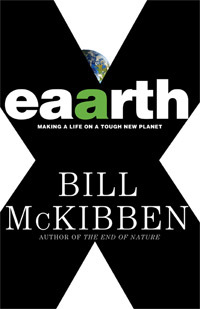 – I’ve read two of McKibben’s books, but I haven’t read this recent book of his. – This is a short memoir about the author’s experience helping to raise his grandchildren after his daughter – their mother – dies unexpectedly. – A comic novel about the workplace. 1984. Vintage. Paperback. 184 pages. 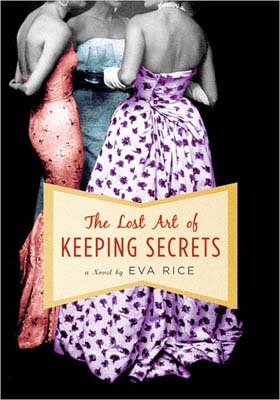 The book opens as Edith Hope, a British romance writer in her late thirties, contemplates her room in the Hotel du Lac, a quiet establishment in Switzerland. She has gone there – one might say, she has been sent there – because of a recent scandal that she caused. During her stay, she meets the assortment of guests who are staying at the hotel at the end of the season. 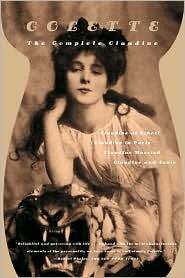 These guests are: stone-deaf, elderly Frenchwoman, Mme Bonneuil; well-dressed, acerbic Monica with her little lap-dog; Mrs. Pusey and her adult daughter Jennifer who seem inseparable, and the enigmatic Mr. Neville. I liked this book; Brookner has a precise and aware way of writing. It makes me think of laying out silverware and place settings somehow. The female guests at Hotel du Lac are well-off women but are on the margins of society for various reasons. Mrs. Pusey is a widow, who clings to her unmarried daughter. Monica, who has an eating disorder, has been sent by her husband to the Hotel in hopes that she might be restored “to working order” and be able to produce an heir. Mme de Bonneuil is shuttled from summer to winter quarters by the son whom she loves but who rarely visits her. Edith has never been married. 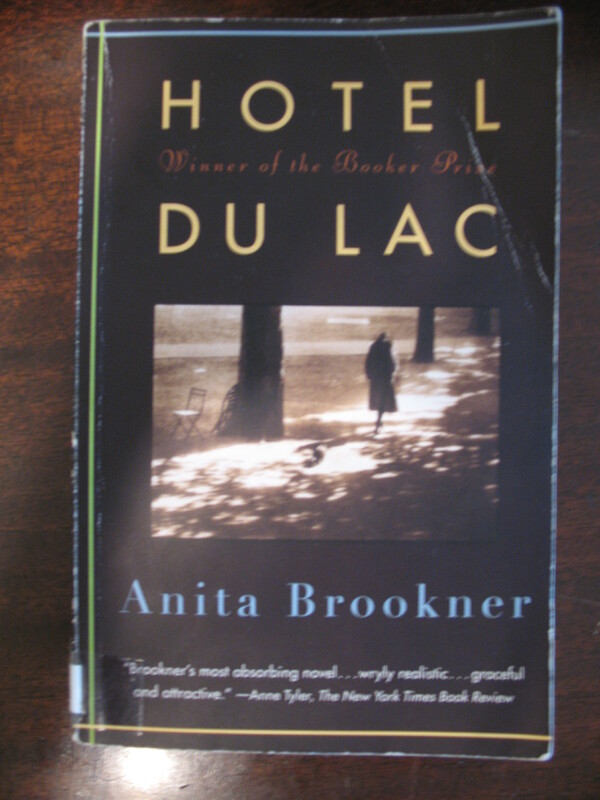 In her reflections on past events and in her interactions at the Hotel du Lac, the reader sees that her unmarried status is something her friends and even new acquaintances regard as something to be fixed if possible. It’s not a new theme, but I like that Brookner doesn’t make Edith a stock unmarried character with broadly painted desperation or defiance. Edith is well-drawn, a complex person who sees the appeal of marriage, who has known love, but finds herself without the romantic ending she gives to the characters of her books. I like Hotel du Lac especially for its ending. So much can hang on an ending. Edith is a sad, quiet figure but it’s not because she is weak or pathetic. Her decisiveness in the end was a triumphant moment for her character, but it’s not a triumph that anyone else in her life would notice. And that resonates with me: there’s so much that happens in one’s head – resolutions, a struggle overcome – that are hard to convey to other people. 2009. Cornell University Press. 142 pages. I have never been a waitress, choosing retail work for my summer jobs instead. I got to know a number of waitresses though, as I spent three summers living in a women’s hostel in a New England tourist town. Although retail yielded its own tales of customers-gone-bad and cranky management, waitresses generally seemed to have it worse. I admired waitresses mostly for what they had to put up with. 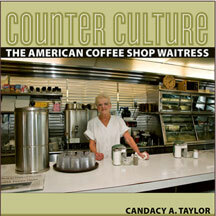 Candacy A. Taylor’s book, Counter Culture, focuses more on the incredible skill and sense of service of career waitresses. Almost of all the women she quotes or profiles in the book have been working for decades as diner waitresses, some for forty to sixty years. They have plenty of anecdotes to share and an obvious pride in their work. I was disappointed in the career waitresses’ nearly uniform dismissal of the younger generation of waitresses. The older waitresses complain about the younger generation’s lack of heart for the work, lack of discipline and care. They tell anecdotes about they went into work with a broken toe, a foot cut by a weed-whacker, and other ailments, and how they rarely if ever take sick days. It’s a little too much of the “when I went to school, I walked 10 miles in the snow . . .” type rhetoric for me. I am at the very beginning of the Millennial Generation, depending on how its defined, and I know there are hard-workers and entitled, lazy persons of every generation. Taylor does note that truth, but it still didn’t stop me from feeling some annoyance at the career waitresses’ categorical dismissal of the younger set. That annoyance aside, this was a thoughtful and interesting book and made me wish I was a ‘regular’ at a place with one of these career waitresses. 2009. Vintage Contemporaries. Paperback. 435 pages. 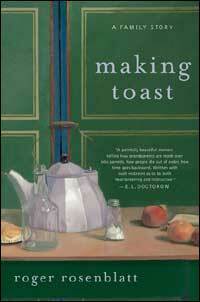 I first noticed this book when I read Jess’ review of it on her blog, Park Benches & Bookends. 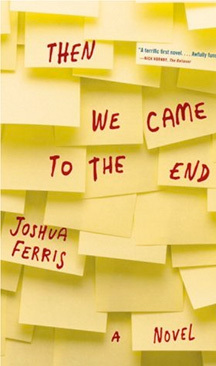 The story begins after the main characters, Emma and Dexter, spend the night together after their college graduation. The day is July 15th. Nicholls then captures the next twenty years of their lives by ‘dropping in’ on the two characters on July 15th of each subsequent year. Sometimes Emma and Dexter are in touch and sometimes they are not. It is a love story of a kind. Just because I could, I symbolically started this book on July 15th. I finished it a few days later. What I like about the book is how Nicholls conveys how hard it is to connect to other people: how we blunder, misunderstand, and awkwardly speak and act to each other. It can be uncomfortable to read at times, but also I’m glad of its honesty. I can get annoyed with books where the characters intuitively understand one another all of the time. Also, by showing how fraught human communication is, Nicholls shows the wonderful value of those moments of real connection. The characters, especially Emma, can be very funny and self-deprecating, and the book has some good humor throughout. That said, there are some sections that are rougher than others. Dexter’s alcoholic bouts are painful and hard to read for example. The sense of regret is a recurring emotion, as the reader sees how the characters’ life paths get diverted and stalled out, even wasted at times. The novel is hopeful, really, even with its tragedies. There may be a couple, or really one, plot point that felt jarring and unnecessary to me, but I’m better at accepting it now than I was when I finished the book yesterday. I wouldn’t necessarily consider One Day to be a must-read, but it’s a very good book and if it intrigues you, I don’t think you will be disappointed in it. Well, this is too bad. I was looking forward to This Life Is In Your Hands. 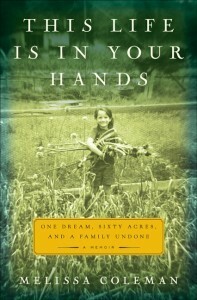 It’s a memoir set in Maine (where I grew up), and about a family that seeks to live off the land on an organic farm in the 1970’s. Unfortunately, after giving the book the ol’ 50-page try and I found I just could not continue further. Ironically, on Miri’s own blog through the looking-glass (which I found just now while looking up her GR review) she quotes someone else’s GR review, a review that also had affirmed me in my decision to stop reading This Life is in Your Hands. As Mama whooshed out the screen door with hair flowing and child-on-back, the kitchen breathed chopped parsley and vegetable soup simmering on the stove, and the light glowed through the kitchen windows onto the crooked pine floors of the old farmhouse where I stood waiting. It was a charmed summer, that summer of 1975, even more so because we didn’t know how peaceful it was in comparison to the one that would follow . . .
As the bell chimed, Helen took my small hand and turned it upward in hers. The kitchen was warm, but her skin cool and leathery. Mama returned with Heidi as I stood long-hair-braided and six-years-brave, holding my breath. I totally get that there’s some beautiful language there, but the writing is so heavy with the strain of earnestness and portent. It’s hard to convey with just a short excerpt, and I probably sound unduly harsh as a result, but I couldn’t get past how labored the writing came across to me in all the pages that I read. Obviously, the writing style will suit some readers more than others. But for those readers who often find that too-beautiful writing is also inert, I’m writing this DNF review for you. “What?” Mama asked, propping on one elbow to reveal her sleep-weary face and matted hair. Papa’s blue eyes met her brown ones with a twinkle, the touch of premature gray in his hair a foil to the youthfulness of his mood. “Get up, come see,” he said, disappearing down the ladder. A thrill lit up her spine. It is obvious that Coleman is proud of her parents despite all that eventually happened (the events of which I know from the book jacket). But that vestigial reverence combined with the writing style and the oddly omniscient viewpoint combine to make her parents not seem like real people – in fact, to be strangely uninteresting to me as a reader, despite the interesting things they did. Sorry for going on so long on a did-not-finish book, but I’m not always able to articulate why I stop reading a book, so I find it gratifying when I can articulate it.